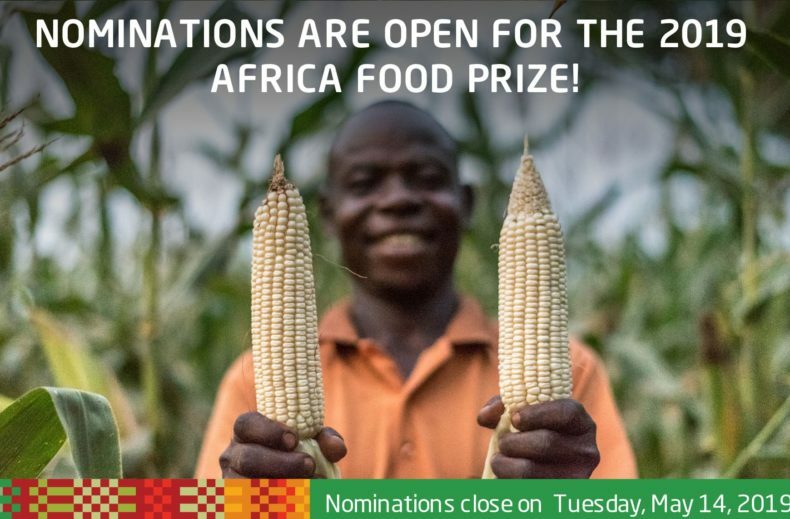 Nairobi, January 15, 2019: Nominations open today for the 2019 Africa Food Prize, an award that recognizes individuals and institutions that are leading the effort to change the reality of farming in Africa—from a struggle to survive to a business that thrives. The US $100,000 prize celebrates Africans who are taking control of the continent’s agricultural agenda. It puts a spotlight on bold initiatives and technical innovations that can be replicated across the continent to create a new era of food security and economic opportunity for all Africans. Agriculture is Africa’s largest economic sector, representing 15 percent of the continent’s total GDP. The industry employs about 70 percent of the continent’s population with smallholder farmers contributing up to 80 percent of the food consumed in the continent. This is not withstanding the perennial under-utilisation of the vast resources in the continent, including over 600 million hectares of uncultivated arable land – 60 percent of the global total. A direct consequence of this under-exploitation of resources is the inability of Africa to produce enough to feed its ballooning populations leading to a constant reliance on international aid. The Africa Food Prize recognizes the efforts of all those that are converting these challenges into opportunities to create wealth and jobs for the continent, its economy and people. Winners are selected by the Africa Food Prize Committee, an independent body of preeminent leaders that is chaired by the former Nigerian President, H.E. Olusegun Obasanjo. The other committee members are Mr. Birama Sidibe, Dr. Eleni Z. Gabre-Madhin, Prof. Joachim von Braun, Amb. Sheila Sisulu, Prof. Sheryl Hendriks, Dr. Vera Songwe, and Dr. Wanjiru Kamau-Rutenberg. Last year, the 2018 Africa Food Prize was awarded to the International Institute of Tropical Agriculture (IITA) for its leadership in generating agricultural research and technologies that have improved food security, nutrition, and incomes for millions of people across Africa; and for its consistent innovation to find new solutions to the continent’s most pressing challenges of youth unemployment, climate change, and pests and diseases. Kenyan professor Ruth Oniang’o and Malian Mme Maïmouna Sidibe Coulibaly were jointly recognized in 2017 for their exemplary efforts in driving Africa’s agriculture transformation. Prof. Oniang’o was recognized for her pioneering leadership in academia, research, and policy to improve food security and nutrition for millions in Africa; and for her groundbreaking work, with farmers’ groups and rural communities, that connects agriculture and nutrition both in research and practice. Mrs. Coulibaly, an entrepreneur and agro industrialist from Mali, was feted for for her illustrative business success in producing, packaging, and distributing improved and high-yielding seeds that have significantly improved the food security and incomes of smallholder farmers throughout Mali and West Africa; and for her inspiring combination of world-class business practices and sound technical skills exemplifying the best of Africa’s agri-business sector. In its inaugural year, 2016, the Africa Food Prize award was given to Nigerian Dr. Kanayo F. Nwanze, the former President of the Rome-based International Fund for Agricultural Development (IFAD). Dr. Nwanze was recognized for his outstanding leadership in putting Africa´s smallholder farmers at the center of the global agricultural agenda. Deadline for nominations is Tuesday, May 14, 2019 and the winner will be announced at a high-profile award ceremony at the African Green Revolution Forum (AGRF) this September in Accra, Ghana. All media materials related to the opening of the Africa Food Prize nominations can be found at www.africafoodprize.org. Follow the conversation at @AfriFoodPrize and share content using #AfricaFoodPrize. The Africa Food Prize began as the Yara Prize, and was established in 2005 by Yara International ASA in Norway to honor achievements in African agriculture. The Yara Prize recognized individuals from Kenya, Ethiopia, Nigeria, Rwanda, Uganda, Malawi, Senegal, Zimbabwe, Tanzania, and Mozambique for their success in making African farms more productive, profitable and resilient. Past winners include Dr. Akinwumi Adesina, the former Nigerian Agriculture Minister who now heads the African Development Bank (AfDB); Dr. Agnes Kalibata, the former Minister of Agriculture and Animal Resources in Rwanda who now serves as AGRA’s President; and Dr. Ousmane Badiane, Africa Director for the International Food Policy Research Institute (IFPRI). Moving the Yara Prize to Africa in 2016 and rechristening it the Africa Food Prize gave the award a distinctive African home, African identity and African ownership.More at africafoodprize.org.